Thereâ€™s a cosmic rule about debt: getting into it is easy, getting out of it is not! Everyone recommends getting out of debt, and while itâ€™s easy to agree with that recommendation, putting it into action is something entirely different. Here are the five toughest things about getting out of debt, but they are obstacles that need to be overcome before youâ€˜ll be able to be successful. 1. Overcoming the force of habit. If youâ€™ve been carrying a significant amount of debt for several years, debt has become a travel companion â€“ an old friend. Like a habit, itâ€™s something youâ€™re used to having around. Anything we are comfortable with will be difficult for us to separate ourselves from. You have to stop seeing debt, or the state of being in debt, as being normal in any way. You need to start seeing it as the obstacle that it truly is. Only when you recognize it as a problem, will you be able to take action against it. If you can resolve that in your mind, the next step is to put your credit cards away, and learn to pay either by cash, check or debit card. By not actually using the credit cards, youâ€™ll be removing both the temptation and the ability to spend more than you have or earn. 2. Learning to spend less. When you use debt frequently you can to buy what you want, rather than what you really need. If youâ€™ve been doing that for a number of years you probably see a lot of wants as necessities, and that has to change. By putting away your credit cards, your debt situation will correct itself almost automatically. But that isnâ€™t to say that it will be easy. Spending less money is a lot like having your allowance taken away. It doesnâ€™t feel good especially at the beginning when the only feeling that you have is one of self-denial. Letâ€™s be honest, the benefits of less spending, and ultimately less debt, all occur later in the process when debt levels begin to fall and thereâ€™s more room in the budget for everything else. Until that time, itâ€™s painful. But itâ€™s also necessary. There is no scheme that you can come up with that will allow you to get out of debt without learning to spend less money. You can cut your spending either by a certain dollar amount, or by a percentage of your income. That difference should be used either to build up savings or to pay down debt, but never for spending. 3. Getting rid of some expenses. Debt isnâ€™t always caused by uncontrolled spending. Just as often, itâ€™s driven by high expenses. 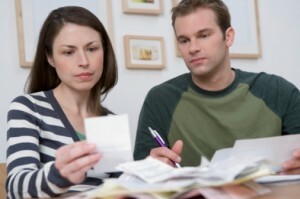 There may be no way for you to get out of debt without cutting some big expenses. This can include a house or a car with high monthly payments. It can also include a second home, boat, or recreational vehicle thatâ€™s eating up entirely too much of your budget. These are large structural expenses in your budget that eat up a disproportionate amount of your income. Until you get rid of some of those expenses â€“ and the assets that are causing them â€“ it may be impossible for you to get out of debt. 4. Putting money into savings. Credit can often be a substitute for savings. You donâ€™t need to have savings because any money that you need for any purpose or emergency can be from credit lines. If youâ€™re in this pattern, youâ€™ll need to reverse it completely in order to point yourself in the right direction. If youâ€™ve been doing this for a long time, making a shift be tough. Youâ€™ll have to make saving money a priority, and that will involve a lot of self-denial. Instead of spending money, youâ€™ll be putting money into savings. Once again, there will be no immediate benefit from doing that. It can take several months or even a couple of years to have enough money saved just a cover emergencies. While youâ€™re saving that money, it will be all obligation and no benefit. But itâ€™s a transition you will have to make in order to get out of debt. 5. Not having enough income. Itâ€™s probably possible to live on any income level no matter how low it is. But thatâ€™s not possible if you have a lot of debt. In order to get out of debt, youâ€™ll probably have to take a number of actions that will include increasing your income. That could mean becoming more focused on your career in a way that will increase your income in the long run. It could just as easily mean that you have to look for additional income sources beyond your primary occupation. That can mean starting your own business as a secondary income, or getting a part-time job. Both activities will cut into your free time, and that wonâ€™t feel good. But in addition to increasing your income, those ventures will serve another important purpose. The time you spend earning additional income will leave you with less time to be out spending money. We donâ€™t think of this much, but boredom is often a reason why we spend money. A second income source will be a double win, as youâ€™ll be earning extra income and denying yourself the time to spend it. It will be tough to get out of debt, but the path will lead to a life not only of less debt, but more income and savings . . . and ultimately less stress and more free time. But nothing worth while is ever easy. Do you feel like you can overcome these obstacles? Leave a comment and explain how! Changing one’s behavior is always the toughest part. For me, creating and sticking to a budget (especially with cash and envelope system) was the toughest to stick with. Also, 6 months in when I was on “autopilot” and my finances were getting incrementally better, it was a challenge to not “reward” my self by spending! Thanks for the great post! Thanks Tony! I think that implementing a plan is 40% of the job–following through is the other 60%. Of course, follow through gets easier as it becomes a habit. But until then it’s a daily struggle. The toughest thing for me is not having enough income to actually make a dent in the debt. I have kept believing that my industry would rebound from the recession, but it has not done so, and my income has been 60% below the usual since 2007 now. Last year I realized it wasn’t coming back and I had to do something different. I’m in the midst of making some changes and ramping up my networking efforts. As an introverted person, networking isn’t my strong point, but I have to do it to get more business. The old world isn’t coming back. Hi Karen–Same here! 2007 too! But I got out in 2008. I love you’re line, “the old world isn’t coming back”–that tells the whole story. Can you move into a new career on a part time basis while still holding on to your old job? Maybe pay off some debt before making a full transition. Hi Cherbrooke–Maybe the stay at home parent can consider some sort of work at home arrangement, to earn some income but still be home with the kids. Try looking on WAHM.com (work at home moms). You can get some ideas there and network with others doing the same thing. On the work at home front, my experience is that you often have to create a niche for yourself, as stable situations aren’t all that common. Hi Adrian–True, beyond the shadow of a doubt. Until you can control your spending and direct your income to where it needs to be, nothing will be accomplished. Instinct would lead me to believe that lack of income is the biggest issue for those heavily into debt but 12 years of experience working with families in every different financial position behavior absolutely is HUGE. Your right realistically any one hypothetically could live on any amount of income, regardless how low.